A professional chef by trade, Adnan and his wife Samira, together with their 7 children, fled from their home in Syria to the desert. They begged the police for food for their children, then made their way to the Zatari refugee camp, on the border with Jordan. At +40C during the day, and -25C at night, it was a harsh place for children. The family paid a guard so they could escape to a city in Jordan, where they lived with 3 other families in a 3-room apartment. Jordan was difficult – documents were taken, and the family did not feel welcomed or wanted. As it was illegal to have so many people in a small apartment, they moved from house to house looking for a place to stay, but rent was very expensive. Syrians were not allowed to work in Jordan and if caught, they could be sent back to Syria. However, desperate to look after their families, many were hired but exploited, being paid $8 a day for 20 hours work. Feras, the eldest son, had his anesthesiologist training interrupted – his years of schooling were completed, but the necessary hospital training remains unfinished. The 18-yr old daughter, married with a baby, was required to stay behind or come to Canada without her husband and infant, as she was not married when the application was made. The family is anxiously hoping that they can raise enough funds to sponsor her, so that the family can reunite. 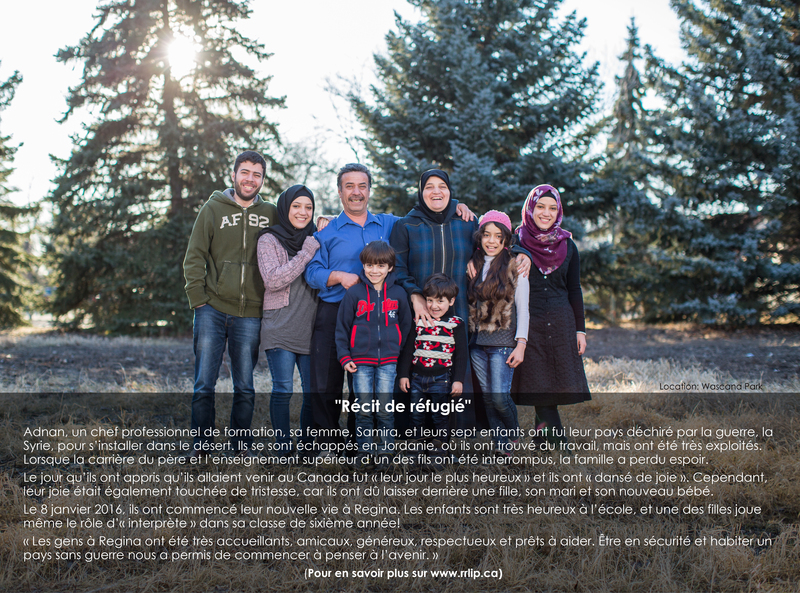 Unfortunately, refugee family members are often sent to different countries, and continue to be separated. 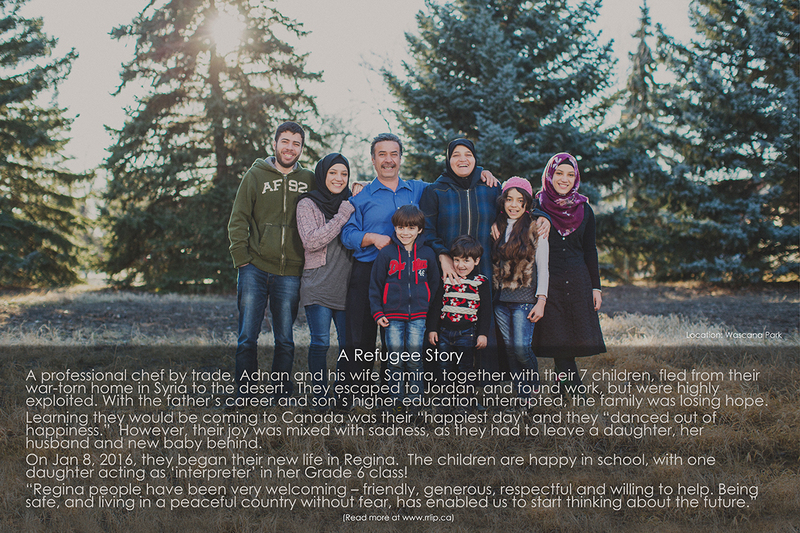 When the family recently learned they would be coming to Canada, it was their “happiest day”, and they “danced out of happiness.” On Jan 8, 2016, they began their new life in Regina. The children are happy in school and one daughter acts as the ‘interpreter’ in her Grade 6 class! “She LOVES English!” English classes for the adults will be starting soon. According to the family, “Regina people have been very welcoming – friendly, generous, respectful and willing to help.” As an example, the family was befriended by the hotel manager, where they first stayed. He has taken them on outings, and they discovered Wascana Park, already their favourite place in Regina. Even with the challenges of transportation, lack of language and unfamiliarity with the city, they said, “being safe, and living in a peaceful country without fear, has enabled us to start thinking about the future” and “allows us to dream about a new beginning - finishing school, starting fresh by making friends, learning English and reuniting with the whole family.” They are so thankful for Canadians and especially for the Regina community, their new home. Adnan, un chef professionnel de formation, sa femme, Samira, et leurs sept enfants ont fui leur pays déchiré par la guerre, la Syrie, pour s’installer dans le désert. Ils se sont échappés en Jordanie, où ils ont trouvé du travail, mais ont été très exploités. Lorsque la carrière du père et l’enseignement supérieur d’un des fils ont été interrompus, la famille a perdu espoir. Le jour qu’ils ont appris qu’ils allaient venir au Canada fut « leur jour le plus heureux » et ils ont « dansé de joie ». Cependant, leur joie était également touchée de tristesse, car ils ont dû laisser derrière une fille, son mari et son nouveau bébé. Le 8 janvier 2016, ils ont commencé leur nouvelle vie à Regina. Les enfants sont très heureux à l’école, et une des filles joue même le rôle d’« interprète » dans sa classe de sixième année!